Meteorologically speaking, we are at the coldest point of the winter. From now on, we can begin to look forward to spring. Economically speaking, housing has been stuck in the depths of winter for two years, and that was the spotlight of the monthly data this week. 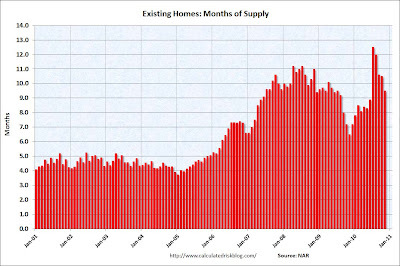 Housing starts declined more than expected to 529,000, but were still above 2009 lows. Permits, however, surged 91,000 to 635,000. 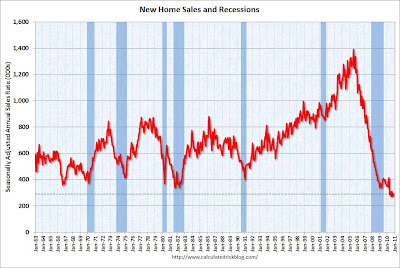 Existing home sales increased for the 3rd time in 4 months, from 4.12 million annualized in August to 5.28 million last month. 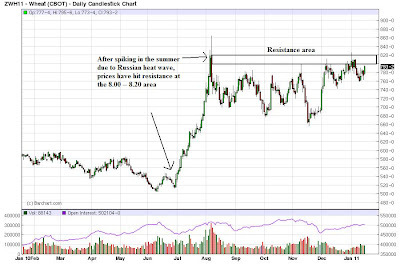 Months of supply was cut to just over 8 months (we'd want to see under 7 months for several months in a row to begin looking for a possible bottom in prices). Billings by architects rose to the highest level in several years, signalling that commercial real estate may also be close to bottoming. Housing permits are one of the 10 leading indicators and helped that gauge of future activity rise 1.0 for December - just about cementing good growth for this quarter. The Mortgage Bankers' Association reported a net decrease of -1.9% in seasonally adjusted mortgage applications. This number has declined over the last 5 weeks, giving back about 1/3 of its uptrend since bottoming in July, and is down -11.0% YoY . Refinancing increased 7.7%, and is actually up YoY, but in real terms remains near low levels equal to many bottoms in the last 5 years. The BLS reported initial jobless claims of 404,000. 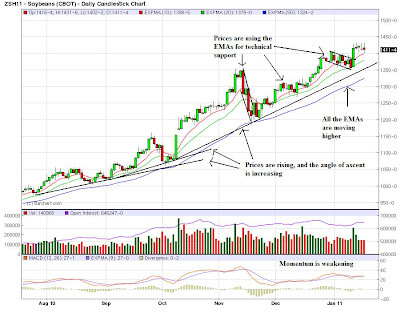 The 4 week moving average declined to 412,000. Last week I noted that "the first full week in January is typically by far the highest number for NON-seasonally adjusted claims all year. Thus the seasonal adjustment is major, and it is easy - and common - for this adjustment to be 'off.'" :This week certainly seemed to confirm that. The downtrend in initial claims is intact, and the real question is whether it stalls at just above 400,000 or moves down into the 300,000. We'll know by the end of February. Gas at the pump went up 1 more cent to $3.10 a gallon last week, while Oil went below the $90 a barrel mark to $89.55 Thursday night. Gasoline usage was up about 2% from last year's levels. The American Staffing Association Index increased 7.7% to 88 for the week ending January 9, entirely for seasonal reasons. This was 13% above a year ago, but about 5% below 2007 levels. Seasonal factors probably finally ended with this week. Railfax generally remained steady in all components last week, and also steady in its comparative improvement over last year. Shipments of waste and scrap metal and auto shipments were slightly better than last year's levels. We are at the low seasonal point for rail traffic, which should start to increase next week. The ICSC reported that same store sales for the week ending January 15 decreased -0.1% w/o/w, but increased a paltry 1.4% YoY. Shoppertrak reported that sales rose 3.3% YoY for the week ending January 15, but were down almost 13% from the week before, suggesting that shoppers took a breather in early January after a strong holiday season. Weekly BAA commercial bond rates gave back -.02%, to 6.07%. This was less than the -.04% decrease in the yields of 10 year treasuries. A reminder that on a trial basis I am using Matt Trivisonno's +1.07% adjustment to withholding data this year vs. last year, due to the recent payroll tax political deal. So adjusting, the Daily Treasury Statement showed adjusted receipts in the first 12 reporting days of January of $99.0 B vs. $96.5 B a year ago, for a gain of $2.5 B. Over the last 20 reporting days, this year shows $159.9 B collected vs. $160.5 B one year ago, or an adjusted loss of -0.8 B. Either we have suddenly had a slowdown (i.e., still ahead of last year's levels, but just barely), or Matt Trivisonno's adjustment is too conservative. We should have a better handle on this after a full month. Finally, a real change in the last couple of weeks: M1 was down -0.5% for the week, up +0.2% month over month, and up +7.5% YoY, meaning "Real M1" was up 6.1%. M2 was up +0.1% for the week, +0.1% month over month - and now, the big change - up +3.9% YoY, meaning "Real M2" was up +2.5%. Real M2 has now, for the first time, joined Real M1 out of the "red zone." There has never been a recession with positive Real M1, or Real M2 at 2.5% or above. Bottom line: we have an economy that is trying to gain momentum, and is being restrained by the choke collar of Oil. P.S. One final note: For a great chuckle to start off your weekend, where the DK Pied Piper of Doom gets completely pwn'd, read this exchange! 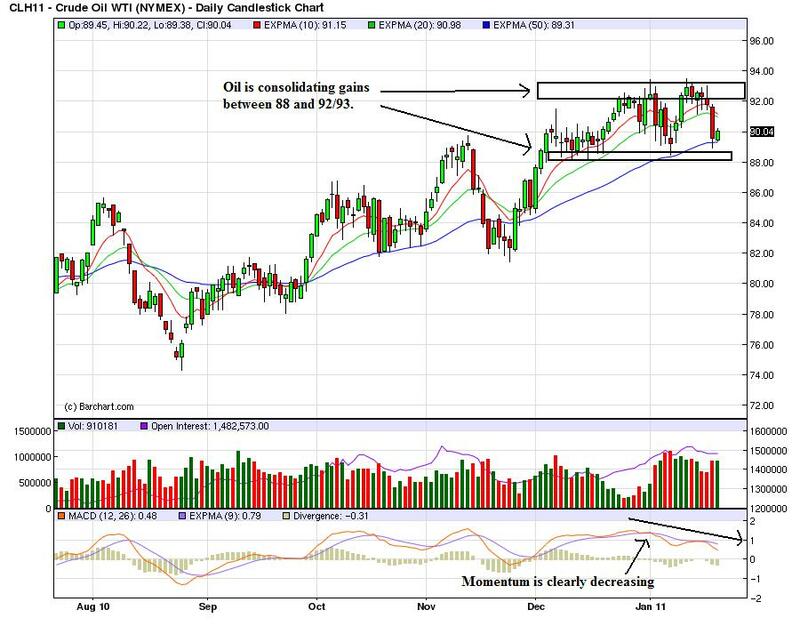 Will Oil Prices Derail the Recovery? In late December, the average national retail price of regular grade gasoline rose above $3 per gallon for the first time since October 2008. 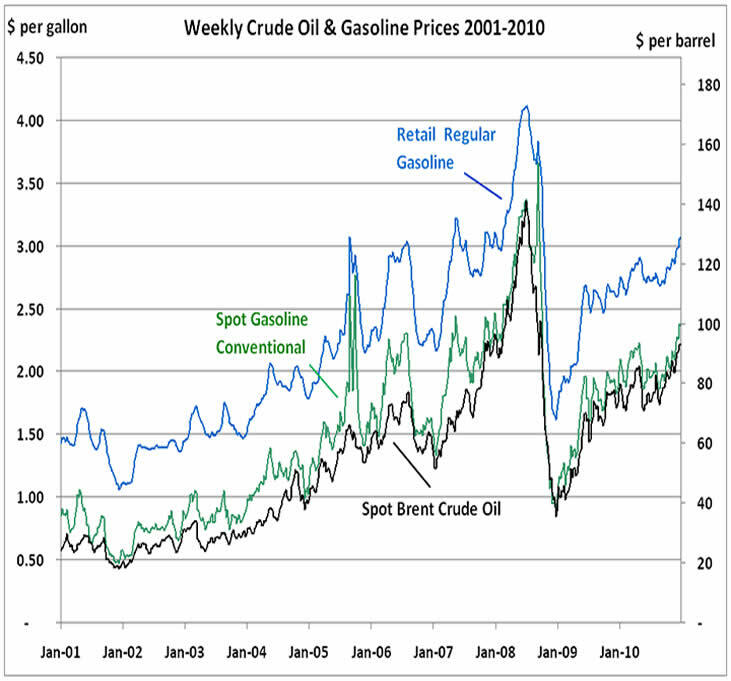 However, when gasoline sold for $3 per gallon in October 2008, gasoline prices were in the midst of a sharp decline that saw prices fall from a peak of $4.11 per gallon in July 2008 before bottoming-out at $1.61 per gallon in December 2008. 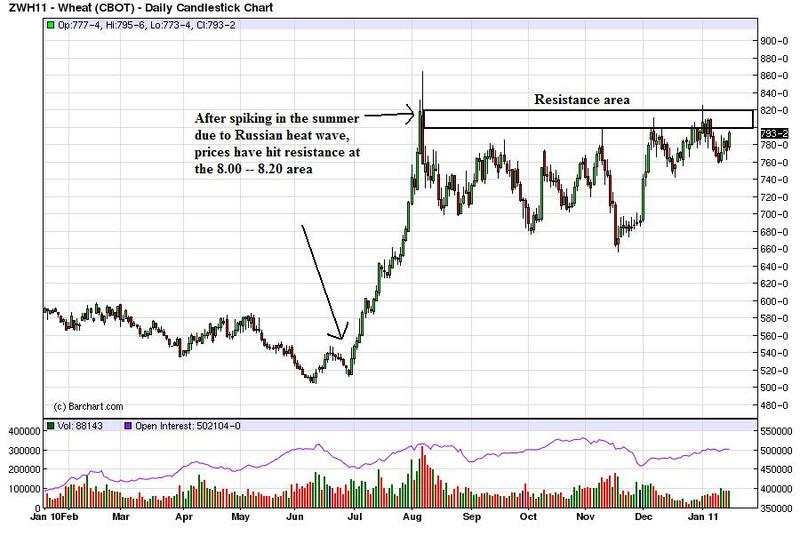 Since then, prices have been on an upward trend. Crude oil prices have risen to over $90 per barrel fueled by world petroleum demand growth, particularly in non-Organization for Economic Cooperation and Development Asian countries such as China and India, and other factors. 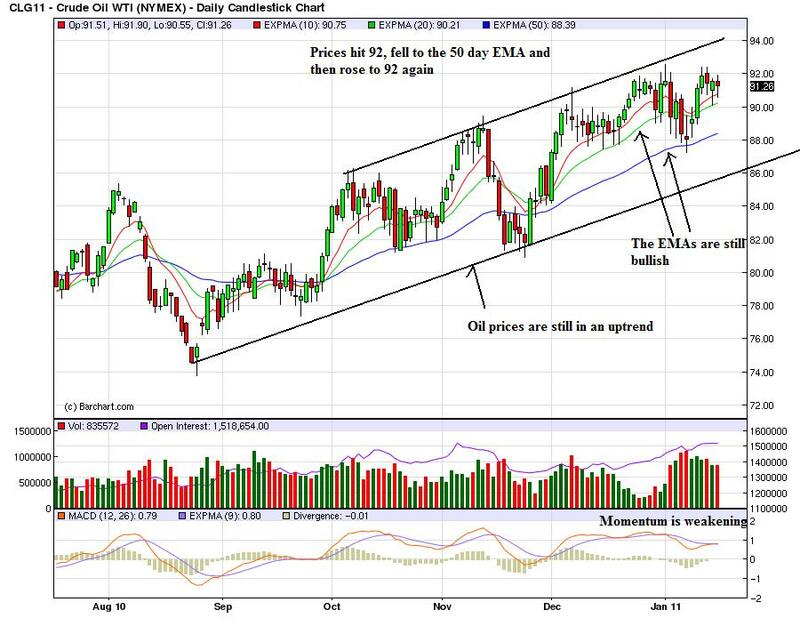 As highlighted in the Energy Information Administration's (EIA) most recent Short Term Energy Outlook (STEO) and last week’s This Week In Petroleum, EIA expects continuing tightening of world oil markets over the next two years, keeping upward pressure on crude oil prices. The price of gas is a key price that consumers see everyday. 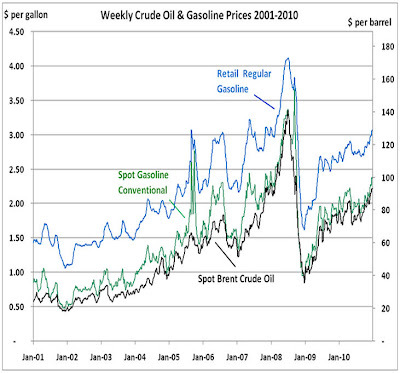 Escalation beyond psychologically important levels (like $3.00/gallon) gives consumers cues regarding the economy. Remember that the spike to over $4.00/gallon occurred before the last recession. The Financial Times -- which has one of the most ridicules copyright policies of any newspaper -- has a story today about the city of Vallejo California. They had to declare bankruptcy, so now there are almost no city services to speak of. Potholes are everywhere and the police are horribly understaffed. The paper goes on to note that this is the future for more than a handful of U.S. cities. But here is the rub: it's all the unions fault for demanding outlandish benefits packages. Never mind that all the parties to the contract sat down at the same table at some point and negotiated a contract in good faith, and never mind the fact that contract terms and conditions and enforcement are a bedrock principal of the legal system. In addition, never mind that collective bargaining equalizes the negotiating process, making any contract negotiated through collective bargaining that must more viable from a contract theory perspective. Also note that despite the love of law and order and always siding with cops and firefighters because they do gods work and they are so brave, now we see politicians running for the doors. Here's the real answer, ladies and gentleman: if you want a nice country, you have to pay for it. That's the bottom line. A country the size of the U.S. requires an expansive infrastructure. We need solid roads, schools, court houses and the like to operate. These things are not free. Yesterday I noted that my home state of Texas is cutting school spending to the bone -- again. This will hurt our competitiveness in 20 years -- long after the idiots and yahoos who made the cuts are out of office. But that is long-term thinking (actually that is thinking in general regardless of the time frame over which we are projecting the intellectual results) which is beyond the pale for most of our culture. The reality is the U.S. is an expensive country to run, plain and simple. If you want a nice country, you have to pay for it. Time is a bit short right now, so I'm going to skip to the data, courtesy of Calculated Risk. 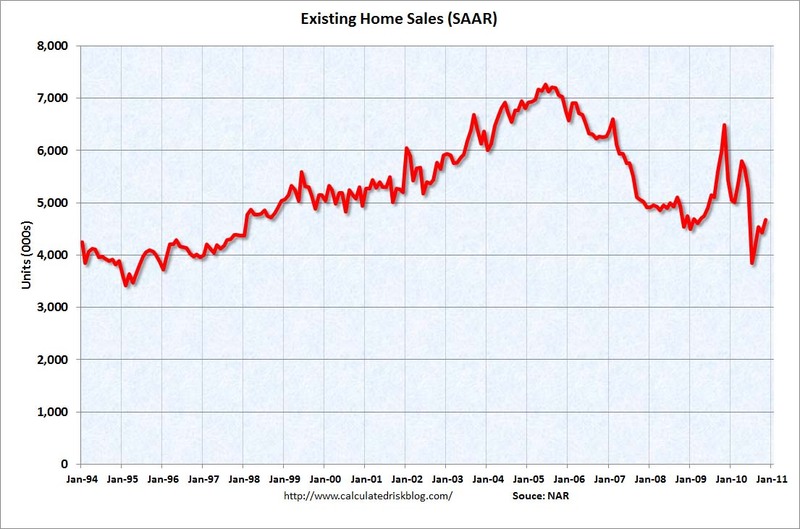 The existing home sales chart shows the distortions caused by the home buyer tax credit, along with a large fall off when sales expired. 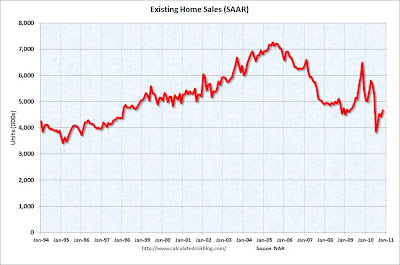 Sales have been rising, but they are still at low levels. The existing home sales inventory. New home sales are near the lowest level seen in the last 40 years. but the market clearing pace is still high. Some firefighters turned in their helmets and police officers their badges Tuesday as part of deep municipal layoffs destined to further erode the quality of life in Camden, already one of the nation's most impoverished and crime-ridden cities. About 335 workers, representing one-sixth of the local government work force, lost their jobs, according to Mayor Dana Redd. It was worst in the public safety departments, where nearly half the police force and close to one-third of the city's firefighters were laid off. Laid-off firefighters walked eight blocks together from the police union hall to Fire Department headquarters, snaking past City Hall, then lined up their helmets in front of the building, picked them back up and started to turn them in along with their other gear. "It's one of the worst days in the history of Camden," said Ken Chambers, president of the firefighters union. "Instead of protecting and serving the city, the residents of Camden, they're choosing to protect their high salaries," she said. Post 9/11, firefighters and cops were rightly praised as heroes; now they're deadbeats for having the audacity to demand a living wage for putting their lives on the line. How dare they. The budget proposes nearly $5 billion less for public education below the current base funding. It is also $9.8 billion less than what is needed to cover current funding formulas, which includes about 170,000 additional students entering the public school system during the next two-year budget cycle. Pre-kindergarten would be scaled back. Higher education funding, including student financial aid, would be slashed. The proposal wouldn't provide funding for all the people projected to be eligible for the Medicaid program and would slash Medicaid reimbursement rates for health care providers. Community supervision programs would be cut and a Sugar Land prison unit would be closed. Funding would be eliminated for four community colleges including Brazosport near Lake Jackson. Thousands of state jobs would be cut. That's a great idea -- let's crimp our future competitiveness by making an already terribly underfunded school system that much worse. Twenty years from now when industry avoids Texas like the plague because the labor force is stupid we have these yahoos to thank. And then in Washington we've learned that the SEC enforcement will be stalled, hindering efforts to -- you know -- prevent and/or catch the Madoff. Brilliant. Here's a news flash for you: cities, counties and the country as a whole costs money to run. You can either pay for it now in the form of some higher taxes or you can pay for it later in the form of crumbling roads, an ill-educated work force or a city where crime runs rampant because of ineffective policing. "problems related to household balance sheets and house prices are the primary culprits of the weak economic recovery." Overall, the county evidence strongly suggests that credit demand is weak because of an overleveraged household sector. This view is supported by survey evidence that the main worry of businesses is sales, not financing. .... Weak consumer demand also helps explain the enormous cash balances currently held by U.S. corporations (see Lahart 2010). These results have important policy implications. If the main problems facing businesses relate to depressed consumer demand due to a household sector weighed down by debt, investment tax subsidies and lower interest rates may have a limited effect on business investment and employment growth. 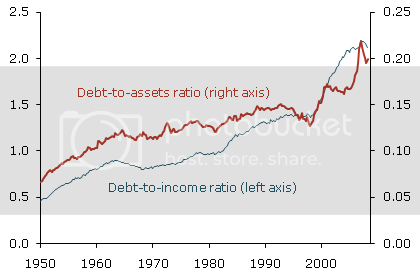 Notice that by this metric, relatively little has been done to discharge the huge run-up in debt amassed by US consumers during the Bush expansion of the first part of the last decade. 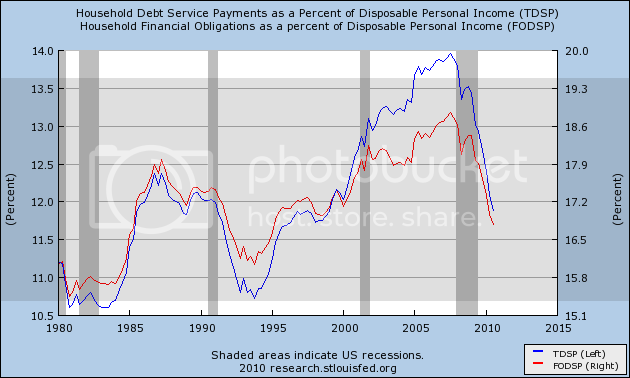 As I've noted before, the difference in the two graphs is the effect of refinancing existing debt at lower interest rates. I'm not sure how much longer the trick of refinancing can be used - unless mortgage rates are going to decline further to 3% or 2% like the Great Depression. Which brings me to the final, depressing, point. On the one hand, the Panics of the 19th century ultimately did resolve themselves, however slowly, without "New Deals." So will this bust. On the other hand, it is a measure of how completely intellectually captured are the political elites in Versaille that while the banksters have been made whole, in the face of the worst downturn since the Great Depression, the only direct aid to consumers/households has been modest tax decreases, and the only aid directly for the unemployed has been the extension of unemployment benefits for some, but not all, long term jobless to a maximum of 99 weeks. The rest, as Atrios says, have been "rimshots" such as aid directed to the states for construction projects. Meanwhile, the single most effective remedy for overextended household balance sheets - "cramdown" authority for bankruptcy judges to write down mortgages on primary residential properties - was tabled by a Congress with the biggest democratic majorities in decades, with the acquiescence of a democratic Administration. Three years ago we could debate the moral hazard and rectitude of such cramdown legislation. The San Franciso Fed's report shows just how huge a price the economy as a whole, and consumers in general, are paying for that choice. Boston: Advertising and consulting contacts in the First District report significant growth in demand during the fourth quarter of 2010, with increases in revenue ranging from 5 percent to 30 percent. Most contacts attribute the rise to pent-up demand across many sectors and industries, as clients have been restrained by economic conditions since 2008. Responding firms held their prices steady or increased them slightly in the fourth quarter; some are planning to raise prices about 5 percent in 2011. Changes in business costs vary, with some firms citing stable wages, some raising compensation, and one firm cutting costs by hiring lower wage-rate replacements for selected employees. All contacts plan to increase employment next year to meet recent and expected increases in demand, with net hiring of 5 percent to 20 percent. Some of them expect salaries to stay stable through 2011, while some expect modest increases. Most contacts are highly optimistic about their near-term performance and throughout 2011, mostly based on the increased volume of deals already secured and growing inquiries from clients. 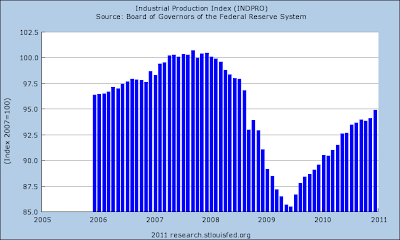 Expectations about general economic recovery in 2011 contribute to these projections as well. They expect annual growth in revenue ranging from 5 percent to 15 percent. NY: A major New York City employment agency that specializes in office jobs, reports that business was relatively good in December--typically a slow time of year. Legal sector hiring has rebounded a bit from exceptionally weak levels, while financial sector hiring has continued to improve gradually. Fewer job seekers are coming in than a few months ago. More generally, non-manufacturing firms report that they are adding jobs, on balance, and many plan to increase staffing levels in the first half of 2011. Manufacturing contacts, however, indicate some recent tapering off in employment levels, based on our December survey. Nevertheless, contacts in both manufacturing and other sectors generally indicate that business picked up in December and express widespread optimism about the outlook for the first half of 2011. Contacts also report widening cost pressures but only a modest pickup in their selling prices. Philadelphia: Service-sector firms generally reported slightly rising activity since the previous Beige Book. Contacts said that the health care sector continued to have relatively better gains than other sectors and that service-sector activity related to construction continued to be weak. The outlook for the services sector as a whole is modestly positive. One contact said, "We see some slight improvement in the near term, but it will be well into 2011 before there is stronger growth." Richmond: The District's non-retail services firms generally improved in December from a month earlier. Revenues rose at most services firms, according to recently polled contacts. Demand picked up at trucking firms, and Virginia airports reported increased passenger travel. Telecommunications firms also noted stronger revenue growth. However, demand for healthcare services was little changed since our last report. Several contacts cited difficulty getting business loans. According to participants in our latest survey, price growth eased slightly at services firms, and average wages also moderated somewhat. St. Louis: Activity in the District's services sector has increased since our previous report. Contacts in the storage, business support services, restaurant, and health care industries reported plans to open new facilities in the District and hire new workers. In contrast, contacts in the hazardous waste disposal industry announced plans to decrease operations and lay off workers. General retail contacts noted that holiday sales increased compared with the same period last year. Minneapolis: Professional business services firms reported increased activity. A contact that supports business travel services noted an unexpected increase in activity since the last report. A large technology company is increasing the number of its contract programmers to support software upgrades. An architectural firm noted an increase in projects up for bid as well as a greater number of bidders. Firms that support the mortgage refinance market noted a sharp decline in activity due to higher long-term interest rates. Dallas: Staffing firms reported demand held steady at high levels. Strength remains broad-based, with particularly strong demand for workers with expertise in the professional, technical, healthcare and finance fields. Contacts noted that call centers were becoming a new source of strength. As in the last report, contacts said direct-hire activity was picking up. All contacts had positive outlooks and expect continued strength in 2011. Frisco: Demand increased further for business and consumer services on balance. Sales continued to expand for providers of technology services, including biomedical products, but they remained largely flat for providers of professional and media services. Restaurants and other food-service providers noted further modest improvements in demand, and suppliers of energy services reported increased deliveries to end-use customers. By contrast, providers of health-care services reported that demand weakened slightly in recent months. Conditions continued to improve for businesses in the travel and tourism industry. Contacts from several major markets in the District noted increases in visitor volumes and hotel occupancies, which resulted from rising business travel as well as tourism. 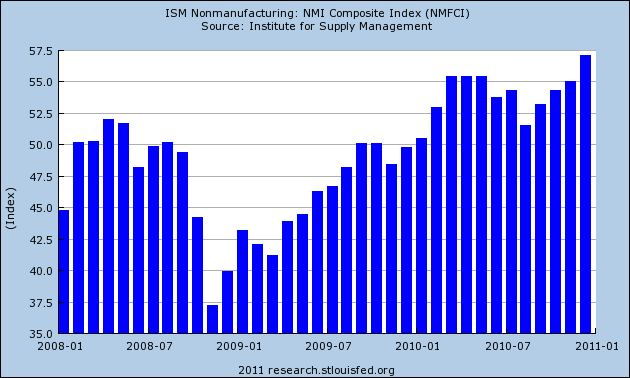 The ISM non-manufacturing composite index is at its highest level in two years. 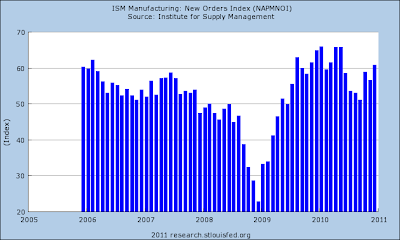 The new orders index jumped to its highest level in five years in the latest report. Also note the business activity index is also at its highest level in five years. November brought continued declines in home values. In fact, the Zillow Home Value Index has now fallen 26% since its peak in June 2006. That’s more than the 25.9% decline in the Depression-era years between 1928 and 1933. Since there was no consumer price sub-index for housing in existence until 1935, Zillow either had to be comparing house prices to the overall inflation rate, or else using a different source. Since then, Zillow has confirmed that its source was Robert Shiller's book, Irrational Exhuberance, in which Shiller says in a footnote that house prices declined 25.9% from 1929 to 1933. 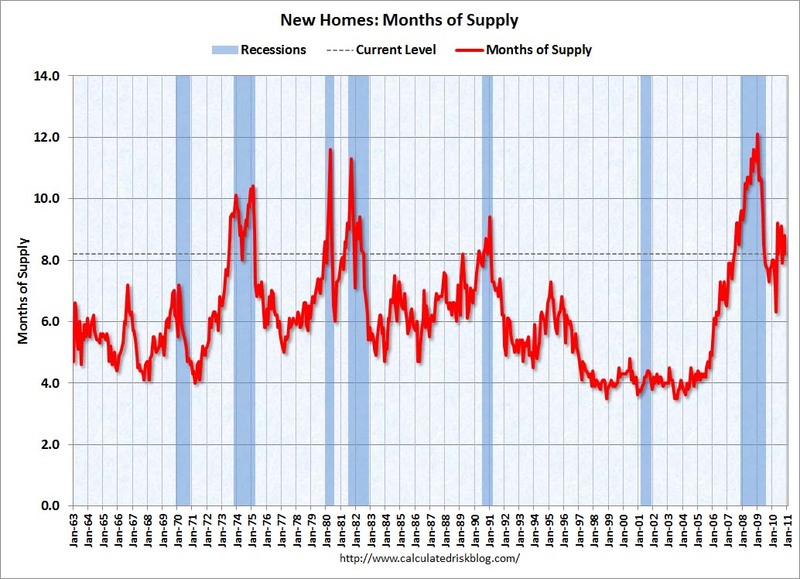 The problem is, like our own era, housing did not peak in 1929. In fact house prices peaked in 1925 according to tables derived by Shiller. Thus Zillow is comparing prices from our peak, but not the peak in the 1920's. For an apples to apples comparison, we need to calculate from peak values. Originally I thought that would negate Zillow's conclusion. The truth turned out to be just the opposite. Using the data from Shiller's price table linked to above, we see the price index declined from a peak of 6.34 in 1925 to 4.41 in 1933, or 30.4% (note: Shiller's table only calculates on an annual basis for that era). In our era, the quarterly index peaked at 190.44 in Q1 2006 and has declined to a trough - so far, at least - of 131.39 in Q1 2009, for a decline of 33.0%. (Since then, it has rebounded slightly to 133.22). But what about in "real" terms? Officially, we have inflation now, vs. about 25% deflation between 1929 and 1933. But of course back then CPI wasn't calculated using "owner's equivalent rent." Which means that doing a Case-Shiller price index adjusted CPI (or CS - CPI) comparison of cumulative price changes is the best method of comparison. According to the BLS, the weight given to owner's equivalent rent is 23.830. For our purposes we can round to 25%. 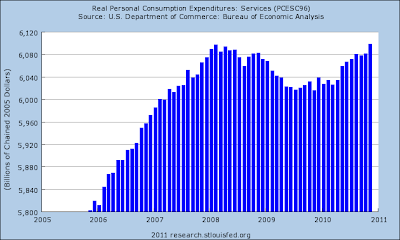 The BLS calculation is that between April 2006 and March 2009, overall inflation was +6.5%. Owner's equivalent rent's 1/4 share of that, believe it or not, increased 7.8%. 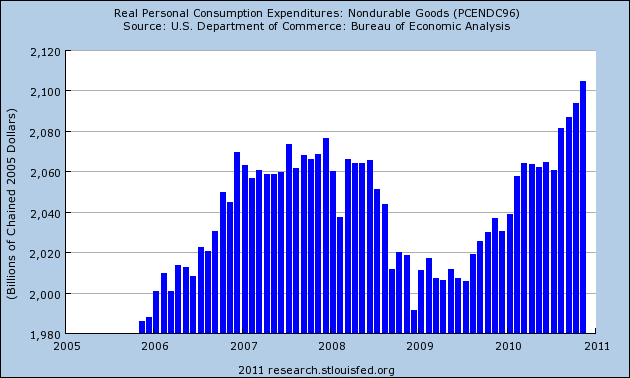 Thus replacing +7.8% with -33.0%, and giving that a 1/4 weighting of the inflation index gives us CS-CPI decrease of -3.4%. In other words, not only have house prices declined slightly more than they did during the Great Depression, but the best apples to apples comparison of inflation from April 2006 through March 2009 means that we experienced a deflationary episode that is the worst since the -4.1% of 1948-50 (the 1938 Recession's was -5.5%). 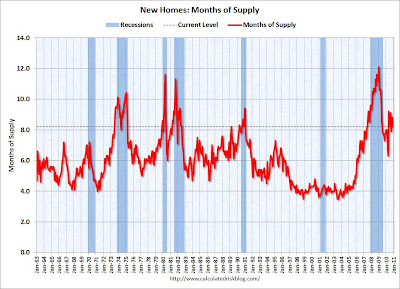 And while they haven't yet hit their 2009 bottom yet, since the expiration of the $8000 housing credit last May, house prices have started to decline again. Technology has had a profound impact on the way business utilizes technology. Hunter Richards provides the analysis in this excellent article. Boston: The majority of contacted First District retailers report positive sales results for the months of November and December. Year-over-year comparable same-store sales are mostly increases ranging from the low single digits to the low double digits, with the exception of one contact who reports a drop in same-store sales but notes a recent positive turn. Several retailers indicate that consumers continue to react positively to promotions. Sales of apparel, sporting goods, cameras, and other gift items were strong leading up to Christmas. Respondents generally are pleased with early holiday shopping results. NY: Virtually all non-auto retail contacts report that holiday season sales were strong and on or ahead of plan, while prices were generally stable. Two major retail chains note that sales in the region were substantially ahead of plan in the weeks leading up to Christmas. A New York State retail association notes that holiday-season sales were stronger than a year ago and stronger than most retailers had expected. While stores in the New York City area generally report brisk sales, a late-December blizzard reportedly curtailed business substantially in the days after Christmas. Two large malls in upstate New York report broad-based strength in sales, despite snowstorms on Black Friday and again in early December; traffic was brisk for most of the holiday season, helped by a steady flow of Canadian shoppers. Most retail contacts report that they hired somewhat more holiday season workers in 2010 than in 2009. Automobile sales were mixed but generally at favorable levels, as both retail and wholesale credit conditions continued to improve. Rochester-area dealers report that sales of new autos surged 24 percent from a year ago in November and appear to be running about 10 percent ahead in December, helped by incentives. On the other hand, dealers in the Buffalo area report that sales were down slightly from a year earlier in November and remained fairly sluggish in December; the inclement weather was seen to be a factor. Philly: Third District retailers generally reported year-over-year increases in line with plans for the year-end holiday shopping period. On balance, stores posted moderate increases in sales without significant unscheduled price reductions. Sales of winter outerwear and jewelry rose fairly well from year-ago levels, but sales of big-ticket electronic items were not strong. A snowstorm on the day after Christmas deterred some shoppers and forced some store closings, but merchants said sales picked up in subsequent days. "The shoppers came. We still did well," one merchant said. Looking ahead, most of the retailers surveyed for this report said they expect continued year-over-year increases in sales, although they also noted that consumer confidence remains fragile. Third District auto dealers reported rising sales as 2010 came to a close. Dealers said that inventories were increasing as they took delivery of new models, but dealers generally considered their stocks of new and used vehicles appropriate for the current sales rate. Dealers expect sales to be somewhat higher in 2011 than in 2010, although several expressed concern that rising gasoline prices could restrain sales of less fuel-efficient models. Cleveland: Reports from retailers on the holiday shopping season were generally positive. General merchandise stores had the strongest results, while activity at small specialty outlets was mixed. Almost all of our contacts said that sales increased in the low to mid-single digits when compared to year-ago levels. Some retailers noted that consumers are becoming more confident, and it is beginning to show in their buying patterns. Nonetheless, we still heard mixed reports on purchases of discretionary items. Looking forward to the first quarter of 2011, retailers generally expect transactions to rise in the low to mid-single digits on a year-over-year basis, and they believe that rising sales will include more discretionary items. Vendor pricing was generally stable. Most retailers plan a modest increase in capital spending during 2011 for remodeling, expansion, and e-business. Hiring was limited to temporary holiday workers and no pickup is expected in the new year. Auto dealers reported new vehicle sales during November were steady to up slightly on a month-over-month basis. When compared to year-ago levels, sales were generally higher. A few of our contacts also noted an increase in leasing activity. Looking forward, dealers expect sales to follow seasonal trends through the winter months. However, they anticipate that sales will be slightly higher than the prior year's level. New car inventories are in line with demand. Reports on used vehicle purchases were mixed. Little change was seen in credit availability. 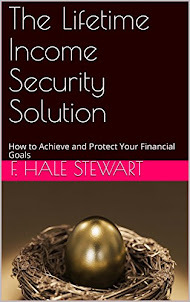 Buyers with high credit scores can readily obtain financing. Dealers' spending on showroom upgrades to comply with factory mandates remains modest. More aggressive capital outlays are dependent on sustainable demand. Richmond: District retailers reported a surge in December sales, particularly for groceries, toys and apparel, according to our recent survey. Several managers at chain discount stores reported solid sales leading up to Christmas. In addition, retailers indicated that Black Friday sales were brisk at big-box stores, as media attention helped pull in customers, but Cyber–Monday also brought a big jump in online sales. One exception was big-ticket sales, which continued to languish particularly for items driven by home sales, such as furniture, according to our latest survey. A central Virginia retailer told us that Black Friday left the local cluster of small shops "looking like a ghost town." However, a new promotion, "Small Business Saturday," bolstered sales that weekend. Retail merchants reported that customer buying patterns have changed; a furniture store owner commented that three out of four of her in-store customers had first browsed the store's website or called for product information. Although snow fell in many areas across the District in mid-December, most roads were clear on the Saturday before Christmas and, thus, the weather did not hinder shoppers. Retail price growth slowed compared to a month ago, according to our latest survey, while average retail wages grew more quickly. Atlanta: Many District retail stores noted that holiday sales were above their expectations. Most indicated that traffic and sales increased compared with a year ago; however, smaller retailers reported less of an increase in business than larger stores. The majority of businesses contacted noted that sales were driven by a mixture of discounting and stronger demand. The outlook among merchants remained optimistic. District automobile dealers indicated that vehicle sales improved recently and were ahead of year-ago levels. Sales of commercial trucks were also up modestly. Chicago: Consumer spending increased in December, as holiday retail sales exceeded those of a year ago. Retailers pointed to sales and promotions, rising consumer confidence, and some pent-up demand as potential reasons for better than expected holiday retail sales. Discretionary spending was up this holiday season--apparel, jewelry, and electronics accessories were particularly strong, while big-ticket electronics and furniture performed slightly better than a year ago. In contrast, auto dealers reported that sales held steady in December despite an increase in showroom traffic. Retailers, in general, expressed a positive outlook for 2011, expecting stable, moderate growth in sales in the first half of the year with the potential for spending to accelerate later in the year. St. Louis: Economic activity in the Eighth District has increased modestly since our previous report. Manufacturing activity has continued to increase, and the services sector has improved slightly. Early reports from general retailers indicate that holiday sales increased over a year ago. Home sales have continued to decline across the District, and commercial real estate and construction activity was sluggish. Overall lending activity at a sample of small and mid-sized District banks declined in the three-month period from mid-September to mid-December. Minneapolis: Consumer spending during the holiday season increased from a year ago. Sales activity was favorable during December compared with the prior year at a Minneapolis area mall. A North Dakota mall manager reported that traffic was up about 3 percent to 5 percent in December from the previous year. In South Dakota, a mall manager noted strong retail activity during the last week before Christmas; some stores reported lean inventory levels following unanticipated strong holiday sales volumes. Also in South Dakota, a toy retailer reported strong holiday sales compared with a year ago. A chamber of commerce representative in northern Wisconsin reported that area retailers were pleased with the holiday shopping season. A Minnesota bank director noted that holiday shopping began earlier this season. According to an auto dealers association in Minnesota, new vehicle sales through November were up slightly from a year ago; light trucks gained market share relative to cars. A Minnesota domestic auto dealer reported strong December sales. KC: Consumer spending improved in late November and December, and many retailers expected further gains in the coming months. Brisk holiday shopping boosted retail sales with some reports of price discounting. Store managers reported that major appliances and household items sold well. Retail sales were expected to edge up further in the next three months. After improving slightly in the last survey, auto dealers reported limited sales, which contributed to larger vehicle inventories. Dealers were optimistic, however, that auto sales would pick up with additional financing incentives and discounts. Restaurant operators reported stronger overall sales despite a continued decline in the average check amount. Dallas: Contacts expect to finish 2010 on a positive note with holiday sales exceeding year-ago levels and outlooks improving modestly. 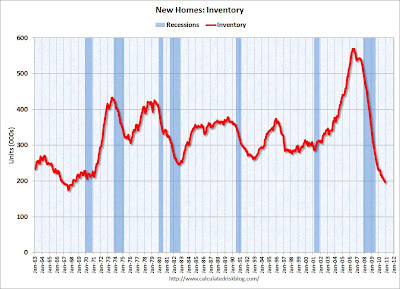 Inventories are at desired levels and in-line with seasonal norms. Two large retailers noted that their sales in the District outperformed those nationwide during the reporting period, but the gap is expected to narrow. 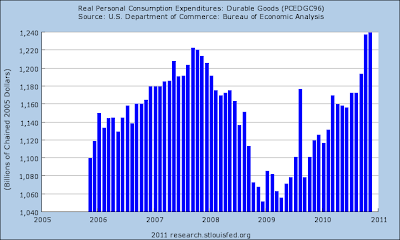 The outlook for 2011 remains muted and contacts expect demand to remain flat or grow modestly at best. 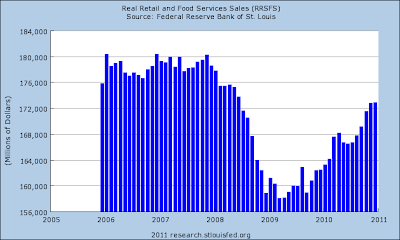 SF: Retail sales increased notably compared with the prior holiday season. Both traditional department stores and smaller specialty retailers reported that holiday sales exceeded their expectations, which were for modest growth. Moreover, tightly controlled inventories enabled many retailers to rely less heavily on price discounts and promotional activity than in the recent past. The pace of sales improved modestly for grocers compared with the prior reporting period, while it remained largely unchanged at a slow pace for retailers of furniture and major appliances. 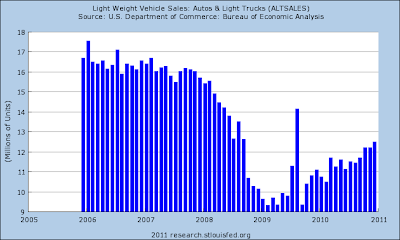 Demand for new automobiles continued to strengthen, particularly for light trucks. Demand for used vehicles was strong as well, and the resulting high trade-in values reportedly helped spur sales of new vehicles. Let's look at some macro-level data. Real retail sales continue to move higher, although they are not at their pre-recession levels yet. 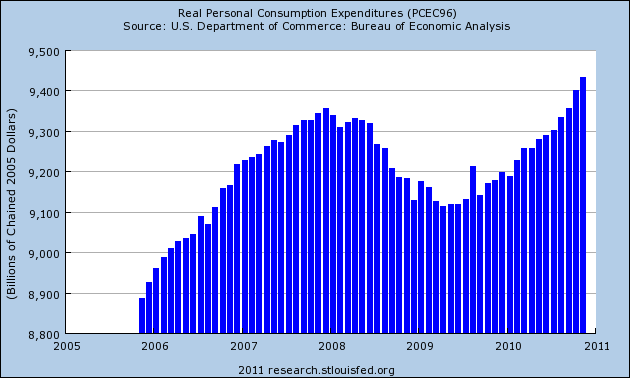 Real PCEs are now above their pre-recession levels. The largest component of PCEs (services) are now slightly higher than their pre-recession peak. Auto sales continue to move higher. 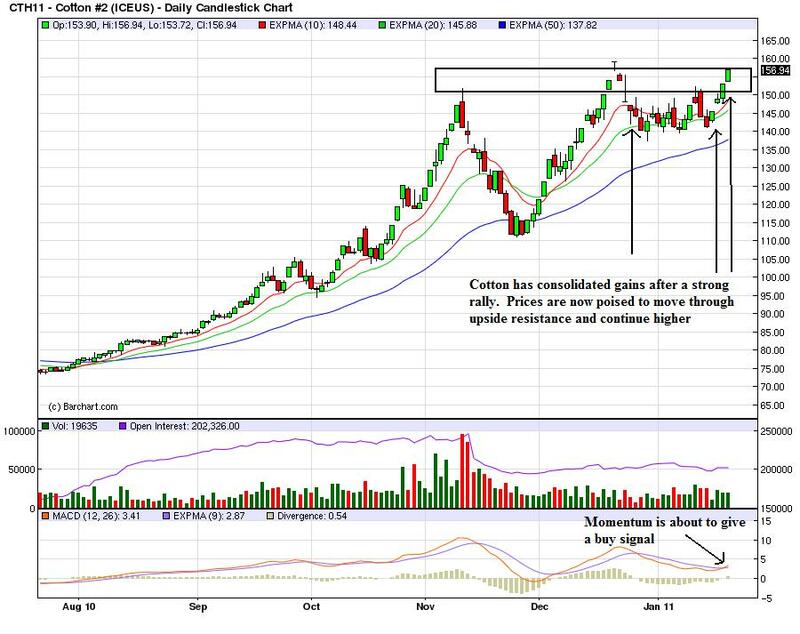 I almost always use candle chart because they provide a great deal of information. However, sometimes less information is better because it clears out the noise. Below are a few line charts of the major market areas -- the SPYs, IEFs, GLD, and UUP -- that show some of the major markets are clearly consolidating right now. 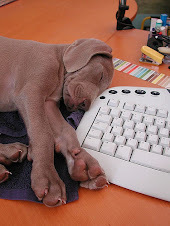 The markets are closed today. I'll post yesterday's market tomorrow AM. Last week, the Federal Reserve published the Beige Book. This is one of my favorite economic documents, because it provides a regular complete overview of the US economy. Therefore, I'm going to spend a lot of time this week going over the data nd providing supplementary information, starting with manufacturing. Overall, the above report is very positive. Demand is stable and strong across all districts. Pent-up demand is starting to show its ramifications; capacity utilization is increasing and some districts will have to start adding capacity. There are three drawbacks to this report. First, construction related manufacturing is still suffering. This should not be surprising, but is still a concern. Second, input prices are starting to increase, and third, hiring plans are "modest." Let's look at the district level information. Boston: The majority of manufacturing firms surveyed continue to report relatively positive business conditions. The exceptions include one firm with exposure to the residential construction sector, whose business has been sluggish for an extended period, and a few others whose business tends to be a-cyclical. On the positive side, a small diversified manufacturer reports sales growth in the high single digits and notes that its revenues have returned to pre-recession levels. A company in the electronics business says that its sales growth in the fourth quarter was slightly ahead of expectations, but is likely to be somewhat inconsistent going forward due to uncertainty about future large contracts. In addition, sales at a semi-conductor firm remain strong relative to 2009 and are on par with their strong results in third quarter 2010; a food products manufacturer also reports strong sales. Manufacturing respondents have mixed, but generally positive outlooks for 2011. One firm reports being "very optimistic" about next year, while most are "cautiously optimistic." In comparison, the firm that has been struggling recently said the outlook for the next three to six months is "lackluster." Many contacted firms remain concerned about their health care costs going forward, and a few expect that the macroeconomic uncertainty will continue to weigh on their sales growth. NY: The Empire State Manufacturing Survey indicates that conditions improved in December for New York State manufacturers. After dropping sharply into negative territory in November, the general business conditions index bounced back above zero, climbing 22 points to 10.6. The new orders and shipments indexes also rose above zero, while the unfilled orders index remained negative. The inventories index was negative, indicating that inventory levels were lower over the month. The indexes for both prices paid and prices received were positive and higher than last month, suggesting that prices rose, while employment indexes were negative, indicating that employment declined. 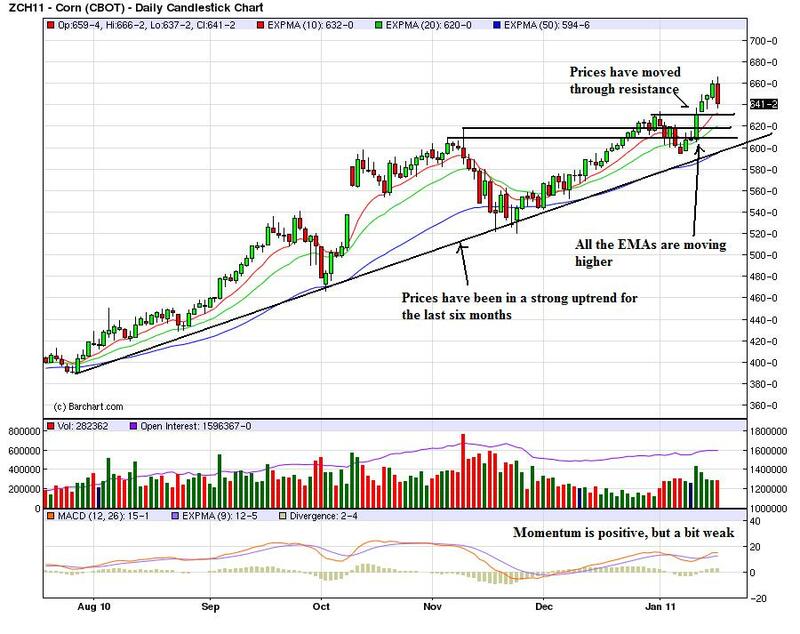 Future indexes were generally at high levels—a sign that conditions were expected to improve over the next six months. Significantly, the future prices paid index was positive and rose sharply, indicating that respondents expected input prices to accelerate. Philly: Third District manufacturers reported increases in shipments and new orders from November to December, on balance. However, gains were not spread among all of the region's major manufacturing industries. Increases in demand for their products were common among producers of furniture, chemicals, testing and measuring instruments, and food products. In contrast, producers of metals, other industrial materials, lumber products, electrical equipment, and machinery generally had month-to-month declines in orders, and other manufacturing sectors reported no change. Overall, the region's manufacturers continued to report that the flow of new orders has been erratic. Several used the words "hand to mouth" and "choppy" to describe the recent trend in orders. Also consider these points from the latest Philly Manufacturing Survey: The survey’s broadest measure of manufacturing conditions, the diffusion index of current activity, increased from a reading of 22.5 in November to 24.3 in December. 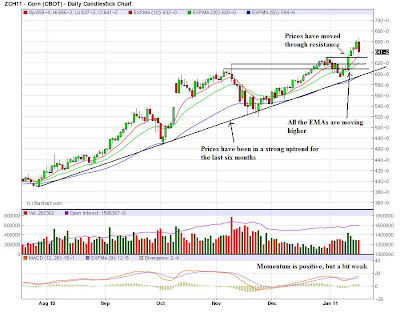 The index has been positive for three consecutive months (see Chart). The demand for manufactured goods is showing continued improvement: The new orders index increased 4 points this month and has increased for three consecutive months. The shipments index declined 10 points, but it has remained positive for three consecutive months. Price increases for inputs as well as firms’ own manufactured goods are more widespread this month. Fifty-two percent of the firms reported higher prices for inputs, compared with 38 percent in the previous month. The prices paid index, which increased 17 points this month, has increased 41 points over the past three months. On balance, firms also reported a rise in prices for manufactured goods: More firms reported increases in prices (21 percent) than reported decreases (10 percent), and the prices received index increased 13 points, its first positive reading in eight months. Cleveland: Reports from District factories indicate that demand was stable or rising during the past six weeks. Compared to year-ago levels, production was higher, with many contacts experiencing low double-digit increases. Several manufacturers noted that while their production levels declined recently--following seasonal trends--orders were above expectations. In general, manufacturers are fairly optimistic and expect at least modest growth during 2011. A few noted that lead times for the delivery of raw materials were getting longer, which they attributed to rising demand across industry sectors. Steel producers and service centers all reported that shipping volume had increased since our last survey, with shipments being driven by energy-related, transportation, and heavy equipment industries. Steel executives we spoke with have heightened expectations for business growth during 2011. District auto production showed a slight decline during November on a month-over-month basis. Compared to a year ago, domestic auto makers showed a substantial rise in production, while foreign nameplates posted a modest decline. Capacity utilization continues to trend higher, approaching what many of our respondents consider to be more normal rates. 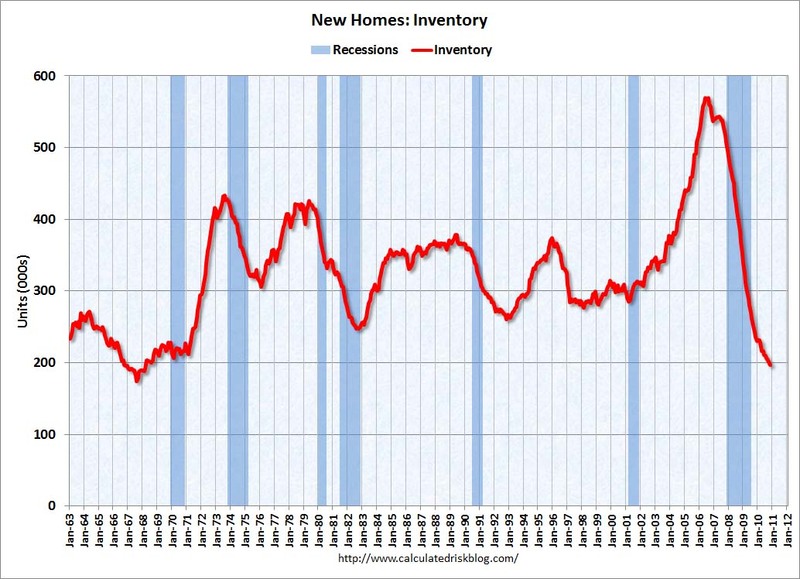 Inventories are close to targeted levels. Capital spending plans are conservative, with only a few of our contacts expecting to increase capital budgets for 2011. Outlays are aimed primarily at maintenance, equipment upgrades, and increasing production efficiencies. Prices for agricultural and metal commodities, steel, and scrap remain elevated, while the prices of most other raw materials have been stable. Several producers announced selective product price increases to reflect a rise in the cost of steel and agricultural commodities. Most contacts told us that they have expanded their permanent, full-time payrolls slightly since our last survey, and they will continue hiring at the same pace during 2011. Permanent new hires were largely salaried. To meet rising demand, employers are extending production hours or bringing in temporary hourly workers. Wage pressures are contained. Companies are continuing to restore merit increases and payments to 401K plans. Richmond: Manufacturing activity posted solid gains in December, building on a pickup in October and November. A chemical producer indicated that shipments continued to improve and he expected his operating rate to be at 95 percent of capacity over the next year. He also expected exports, a major part of his recent business gains, to improve further in 2011. An auto-parts supplier said that demand from auto manufacturers continued to exceed initial forecasts, resulting in material shortages and higher supplier costs. A machinery manufacturer noted that his automotive business remained very strong and he anticipated additional strengthening in 2011. He pointed out that other industrial businesses were also picking up nicely. A building materials manufacturer reported that orders were surprisingly strong compared to three months ago, which he attributed at least in part to inventory restocking. Survey contacts reported that prices of raw materials grew at a somewhat quicker rate than in our last report, while prices of finished goods were little changed. Manufacturing activity in the central Atlantic region expanded at a quicker pace in December according to the Richmond Fed's latest survey. All broad indicators — shipments, new orders and employment — posted solid gains. 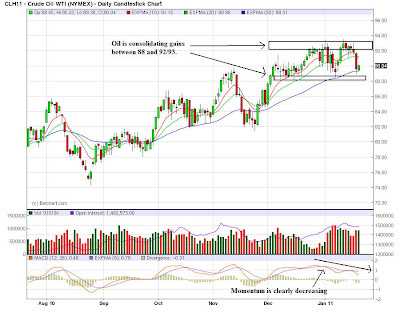 Other indicators also suggested stronger activity. District contacts reported that order backlogs returned to positive territory and capacity utilization grew at a faster pace. Manufacturers reported that delivery times grew at a somewhat higher rate, while inventories grew at a somewhat slower pace. Looking ahead, manufacturers' assessments of business prospects for the next six months were generally more optimistic in December. Survey contacts at more firms anticipated that shipments, new orders, backlog of orders, capacity utilization, and capital expenditures would grow more quickly during the next six months. Atlanta: Sixth District manufacturers reported a modest increase in new orders and production levels, while finished inventories contracted only slightly. Several respondents expressed plans to increase production in the short-term. Goods producers tied to the construction sector continued to report very low levels of activity. Manufacturing-related transportation companies reported moderating freight volumes after significant increases earlier this year. Regional rail shipments of farm products increased since the last report, nearly reaching double their year-ago level, while shipments of motor vehicles and equipment declined. The outlook among transportation firms remains optimistic for 2011 as moderate growth in shipments is expected for the first half of the year. Chicago: Manufacturing production improved again in December. New orders were solid and order backlogs increased substantially. In general, contacts expressed a positive outlook for growth in manufacturing next year. Several manufacturers of tubes, hydraulics, and other fluid power products noted that activity had returned to its previous peak levels of 2008, and was expected to increase further in the coming year. The fabricated metals, automotive, and heavy equipment sectors were also expected to remain strong sources of growth. A contact reported that global steel consumption was likely to reach an all-time high in 2011. In addition, contacts noted that pent-up demand remains in the motor vehicles sector, with the average age of both light and heavy vehicles still rising. Demand for heavy trucks, in particular, was expected to be even stronger than previously anticipated. In contrast, a contact in the appliance industry noted that shipments were weaker than expected in the fourth quarter, but were still higher than the prior year. St. Louis: Manufacturing activity has continued to increase since our previous report. Several manufacturers reported plans to open plants and expand operations in the near future, while a smaller number of contacts reported plans to close plants or reduce operations. Firms in the automobile and automobile parts, plastics product, glass, furniture, sanitary paper products, and food manufacturing industries reported plans to expand existing operations and hire new employees. Contacts in the household appliance and paper manufacturing industries reported plans to open new facilities in the District and hire new employees. In contrast, firms in container manufacturing and wood products manufacturing announced plans to close plants and lay off workers. Minneapolis: Manufacturing output was up since the last report. A December survey of purchasing managers by Creighton University (Omaha, Neb.) showed increases in manufacturing activity in Minnesota, South Dakota and North Dakota. A South Dakota maker of video display systems noted increased new orders since the last report. A Minnesota equipment component producer noted strong sales and was increasing production capacity. A bank director reported that regional manufacturers were busier than a year ago. KC: District manufacturing activity strengthened further since the last survey, and plant managers were increasingly optimistic about future activity. Plant managers reported that production, shipments, and new orders increased in December, led by durable goods manufacturers. 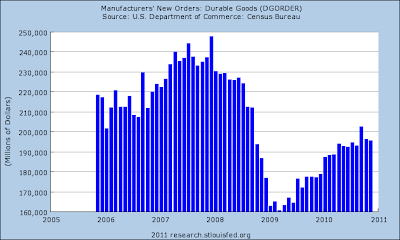 During the first half of 2011, manufacturers expected new orders, shipments and production to rise, and finished goods inventories to remain flat. Some factory managers planned to increase employment levels as well as capital spending in the coming months. Stronger demand for computer software and IT consulting contributed to a rise in sales at high-tech firms. Activity in the transportation sector slowed since the last survey period but remained above year-ago levels. Also consider the latest KC Fed manufacturing report: The net percentage of firms reporting month-over-month increases in production in December was 21, unchanged from 21 in November and up from 10 in October (Tables 1 & 2, Chart). Specific industry activity was mixed, with the majority of durable firms reporting an increase in production while some nondurable firms noted a slight downturn. Most other month-over-month indicators improved somewhat from the previous month. 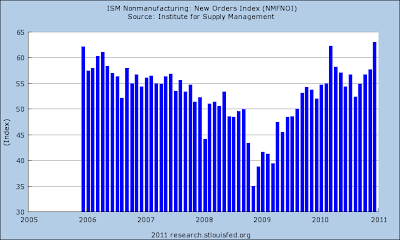 The shipments and order backlog indexes climbed higher, and the new order index was basically flat. The employment index increased to its highest level in three years, while the new orders for exports index edged down from 11 to 7. The raw materials inventory index moved into positive territory, and the finished goods inventory index also inched higher. Growth in year-over-year factory activity increased in December. The production index improved from 27 to 32, and the shipments, new orders, and order backlog indexes also edged up. The employment index rose for the second straight month to its highest level in nearly 3 years, and the capital expenditures index increased from 9 to 19. 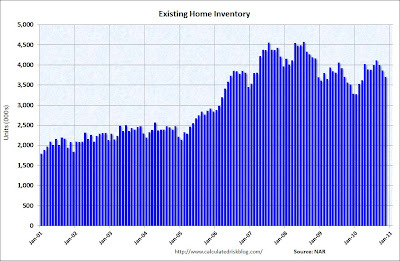 Both inventory indexes rose further from last month, after nearly two years of negative readings. Future factory indexes improved considerably from the previous month. The future production index jumped from 23 to 41, and the future shipments, new orders, and order backlog indexes also rose. The future employment index increased from 13 to 27, and the future new orders for export index also edged higher. The future capital expenditures index improved from 12 to 22, a three-year high. The raw materials inventory index moved into positive territory for the first time since April, and the finished goods inventory index also increased from -5 to 0. 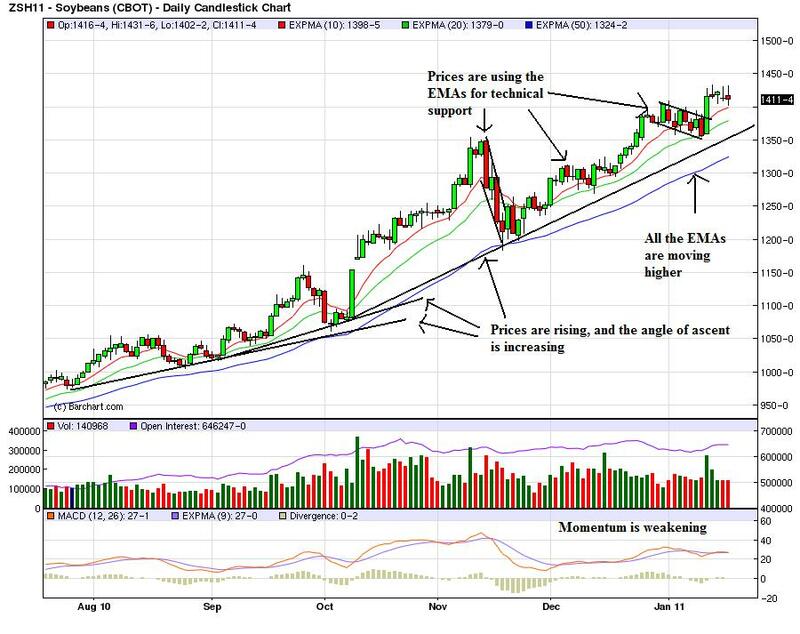 Price indexes continued to rise. The month-over-month finished goods price increased from 3 to 18, and the raw materials price index jumped from 35 to 54. The year-over-year finished goods price index climbed higher, and the raw materials price index edged up slightly from 62 to 67. The future raw materials price index recorded its highest level since mid-2008, and the future finished goods price index also increased, as slightly more firms plan to pass recent cost increases through to customers. Dallas: Most construction-related manufacturers reported steady demand at low levels, although there were reports of stronger demand related to apartment construction and business remodeling. Outlooks were generally more optimistic than in the last report, with contacts expecting some improvement this year. Also consider these points from the latest Dallas Manufacturing Survey: Texas factory activity increased in December, according to business executives responding to the Texas Manufacturing Outlook Survey. The production index, a key measure of state manufacturing conditions, was positive for the fourth consecutive month. Other indicators of current activity also remained positive, signaling continued growth in manufacturing. The shipments index held steady at a reading of 8, and the capacity utilization index rose from 10 to 15, with 29 percent of manufacturers reporting an increase. The new orders index declined in December but stayed in positive territory, with more than three-fourths of firms noting increased or unchanged order volumes. Measures of general business conditions remained positive in December. The general business activity index came in at 13, with nearly a quarter of respondents noting improved activity. The company outlook index edged down to 15, although the share of manufacturers who said their outlook improved rose to its highest level since May. Labor market indicators improved notably this month. The employment index rose from 6 in November to 15 in December, reaching its highest level since early 2007. Twenty-four percent of firms reported hiring new workers, compared with 9 percent reporting layoffs. Hours worked increased again this month, and the wages and benefits index rose from 5 to 10. SF: Manufacturing activity in the District continued to expand during the reporting period of late November through the end of December. Demand grew further for manufacturers of semiconductors and other technology products, with contacts noting balanced inventories and high levels of capacity utilization. Production rates remained at or near capacity for makers of commercial aircraft and parts, as an existing order backlog for larger aircraft was reinforced by rising orders for smaller commercial jets. Metal fabricators saw further increases in demand; sustained improvement has brought capacity utilization back near normal and prompted some firms to rehire employees laid-off over the past two years. Petroleum refiners continued to reduce their output and work down inventories, which have been at elevated levels in recent months. Conditions remained depressed for manufacturers of wood products. While not at pre-recession levels, industrial production continues to move higher. The latest report was very strong. 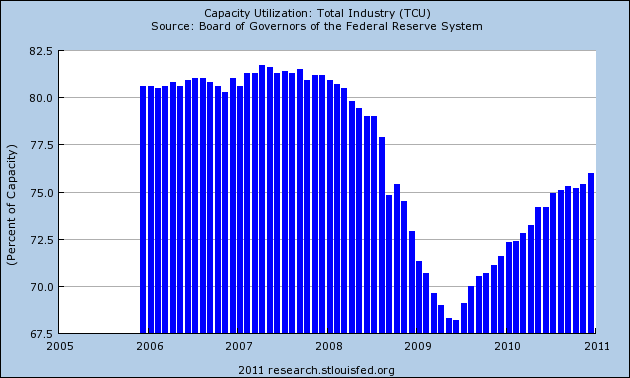 Overall capacity utilization also continues its move higher. 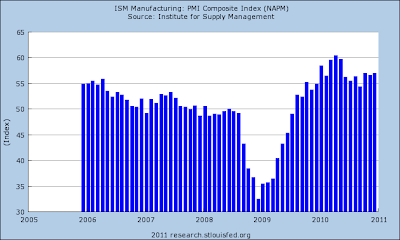 Overall manufacturing activity is at pre-recession levels. 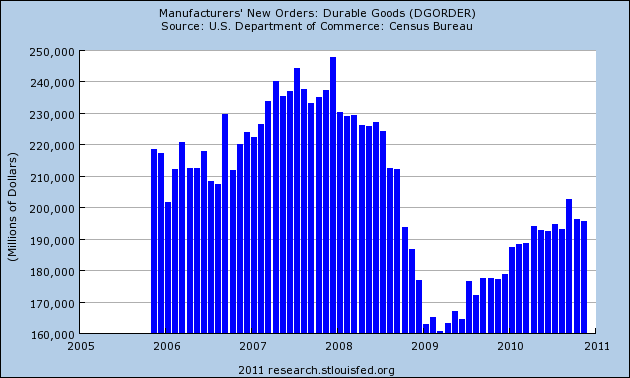 New orders for durable goods is still moving higher, although it is not at pre-recession levels yet. Overall, the anecdotal information is very positive -- demand is good, new orders are strong, and all districts are showing improvement. For reasons unknown, the Philadelphia region appears to be having problems right now. Several districts reported that capacity utilization was at or near pre-recession levels and therefore they would start to see an increase in capacity over 2011. The auto sector is doing well; several regions reported good results for this sector.